The ABC See, Hear, Do Giant Flashcards are the letter/animal/action pages from the book ABC See, Hear, Do: Learn to Read 55 Words in printable form. They are 8.5x11 and include all 26 letters. We suggest printing the flashcards and then laminating them for durability. These flashcards are not only great in group settings, such as preschools or storytimes, but they are also useful at home. It can be hard to hold the books open with one hand while demonstrating the actions with the other. Yet it’s easy to lean the giant flashcards against your body in order to use both hands to demonstrate the actions. Hold up a flashcard, say the letter name and sound, and do the action. Feel free to work on a couple letter sounds a day, or focus on just one letter per week. As you go, review all the actions and sounds your child has already learned. This helps reinforce the letter sounds, and it’s fun! Lay out 4-8 flashcards. 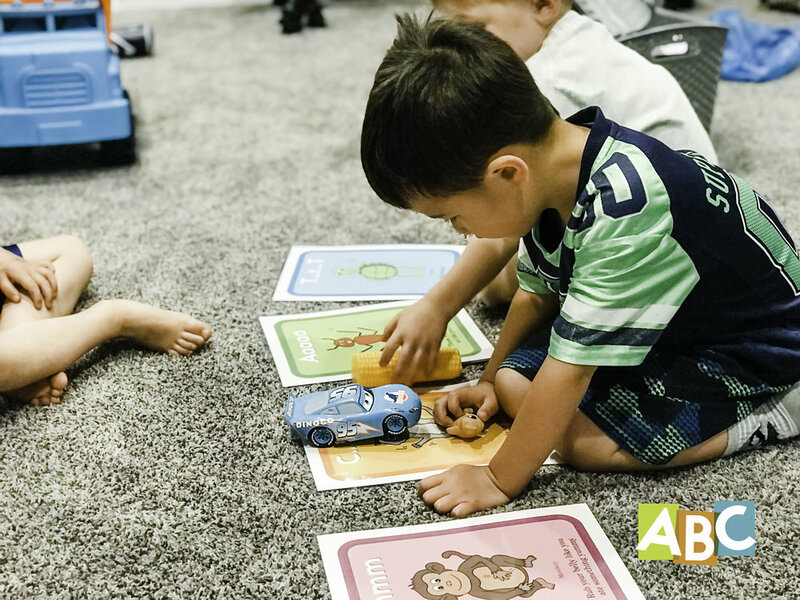 Have a child stand a few feet away and toss a bean bag onto one of the flashcards. For whichever letter the bean bag lands on, the child must make the corresponding sound and action. Gather toys that start with the letters you are currently working on. Lay out 4-8 letters at a time. Encourage your child to pick a toy out of a bag and match its beginning letter sound to the corresponding flashcard. Place the flashcards on the floor in a large circle. Tell the children to walk from card to card while you play music. When the music stops, the children must stop. For whichever flashcard they are standing on, they must give the sound and do the action. Tape 4-8 flashcards on the wall around the room. Close your eyes and ask the children to stand by one of the flashcards. With your eyes shut, say the letter sound and do the action of one of the cards. Whichever children are standing by that card are out and must sit down. The remaining children move to a new spot. Continue until just one child is left. Give each child a stuffed animal. Encourage them to “teach” the stuffed animal how to do the action for each letter by first showing their stuffed animal how to do it, and then making the stuffed animal do the action while the child says the sound. Tape the flashcards to the backs of chairs. Place the chairs in a tight circle, facing out. Turn on music and tell the children to walk in a circle around the chairs. When you turn the music off, each child must sit in a chair, look at the flashcard on the back of their chair, and say the sound/do the corresponding action for the letter. Turn the music back on and repeat for a few rounds. Do you have other ideas for using the ABC See, Hear, Do Giant Flashcards? We’d love to hear them! Please comment below or tag us on Instagram/Facebook and tell us all about them!